I'm going into "Baby Phase"
Now don't get excited, I'm not having a baby, but I will soon have a granddaughter. My son and his wife are expecting their second child in November and they've been told it's a girl, so on with the pink baby stuff! Isn't this little tyke just darling? The card is a 5" x 5" card and the base is Berry Sorbet by PTI. Their cardstock is superb. I added a layer of Lace Cardstock by KI Memorins and it's called "hearts blushing". 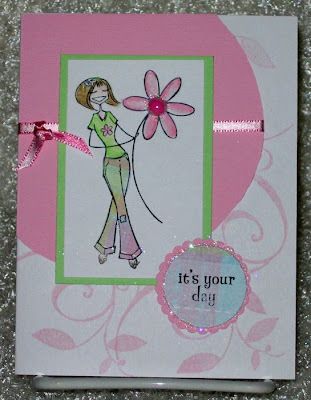 I picked this gorgeous paper up at Stamping Bella, along with the Flower Soft I used for the pod and around the sentiment. 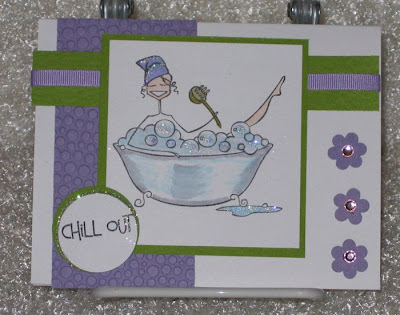 The image and sentiment are also Stamping Bella products. I also used a bit of Sweet Blush by PTI for the sentiment and under the image. Really, Emily's store has such wonderful product and, they have a card that you can earn money with and use as a credit when you have enough. Call they store, they'll explain it better than I ever could. All I know is that the more I spend, the more points I earn and can apply to purchases when I've earned enough. 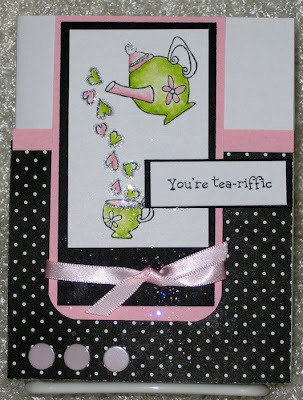 Now, this card I just love. 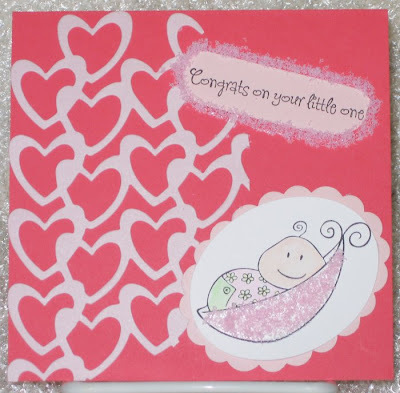 I fell in love with the DP from Stamping Bella and it's Baby Words on Shimmer Glitter Paper by Heidi Grace Designs. It's beautiful and the picture doesn't do it justice. I mounted a 4-1/4" x 4-1/4" square onto a 4-1/2" x 4-1/2" bit of Sweet Blush and then adhered it to shimmering white cardstock cut to 5" x 5". I punched a scallop circle with my SU punch and used the Glamour dust around the edges. 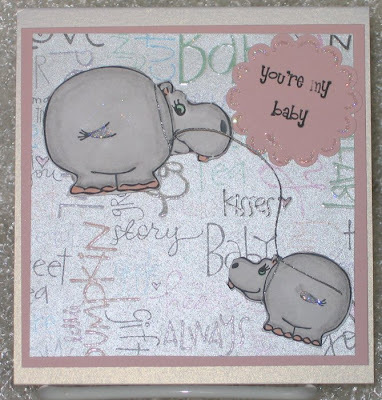 The hippos, Mom and Baby, are from Gina K. Designs company. They were created for Gina K. by Melanie Muenchinger. They're so cute. They were coloured with Koh-I-Noor pencils and OMS, ct out and adhered with pop-dots. I attached the mom and baby using some silver thread. I sure hope you like them, 'cause I sure do. While I was at Stamping Bella yesterday, I did a little?? shopping. I picked up loads of new papers and two stamps. The first card showcases the new stamp I bought. It is Bella's Chariot. I just thought it was the cutest pumpkin evah! I used my Koor-I-Noor pencils and OMS to colour the image. The sentiment is from Technique Tuesday. 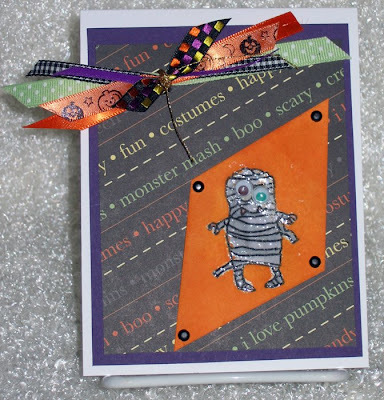 The orangey/tanny coloured paper is by Prism, also available at Stamping Bella and the pin in the ribbon is also from my shopping trip there. It is really a sunflower yellow colour, but I used BV08, Blue Violet, Copic marker on it and some Glamour Dust to spice it up. 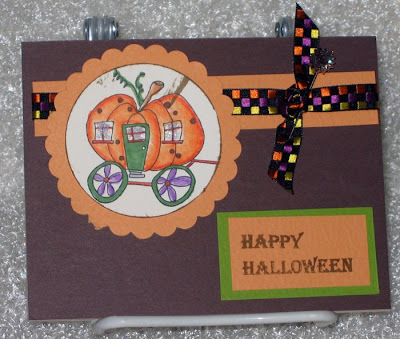 The card base is Craft paper with an added layer of Chocolate Chip for good measure! The second card has a bit of new paper. It's by Best Creation Inc. You should check out their website, it looks fairly new to me, at least. 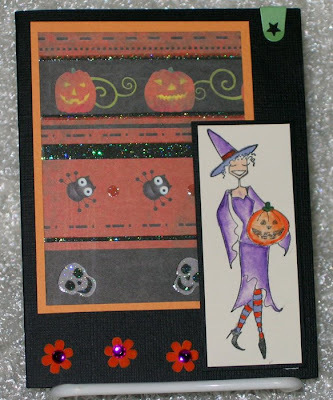 Of course, the star of the card is Witchybella. She's pretty glamourous for a witch, don't ya think? Again, I used the Koor-I-Noor pencils and OMS to colour the image. A few little Maya Road felt flowers, a few purple baubles and she's ready to go a-haunting! That is the name of the class I attended yesterday at the one, the only, Stamping Bella Boutique in Thornhill, Ontario. What a terrific time and I did learn a few things, too! The class instructor was Nicky Manel. You can see her blog here. ALL of these cards were designed by Nicky and I must say how totally organized she is. Each of the participants was given five baggies containing all of the contents needed to create the cards. The pieces were pre-cut, the ribbon was pre-cut and little flowers were pre-punched. 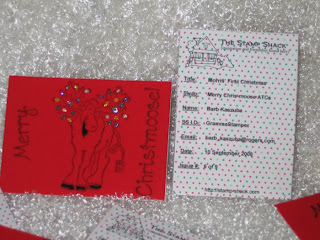 All we had to do was stamp the images, colour them, add the "sparkle" and assemble the card. Even with all the pre-work that Nicky did, I still had to make the last card at home, but that was by choice. I wanted to get ahead of the rush-hour traffic which can be horrendous getting across the top of Toronto. Because I didn't finish at the class, the card I did at home has a different image than what was used at the class. I wish I had stamped the image first, but alas, I didn't think that far ahead. So, I improvised using BubbleBella instead of Tiny Teacup (which I love, BTW, and WILL have very soon). Here are the cards, in no particular order. Of course, all the stamps are Stamping Bella, the baubles are Bella's Baubles and the sparkly stuff is Glamour Dust by DecoArt. EVERYTHING is available in the store and on-line so go check out the website. If you live in the GTA, or even further, and can get to the Stamping Bella Boutique, it's worth the drive. Go check out their calendar, I'm sure you'll find something to suit your crafting style, whether it be cardmaking or scrapbooking. And, for heaven's sake, go shopping. I certainly did! This is the first, of what I hope will be many, times I will be able to use this very versatile set by JessicaLynn Original Stamps. The base is orange c/s by CTMH's Carnival collection. On top of the base is SU's Very Vanilla, but I used several inks and blended them together, then stamped some of the small stamps in the set and stamped the background. It's a very messy process, but I like the look of it. It's the technique I learned last weekend when I attended a class at my LSS. The monster is also stamped onto Very Vanilla and coloured with Copics (what else! )and adhered to a scrap bit of purple c/s. 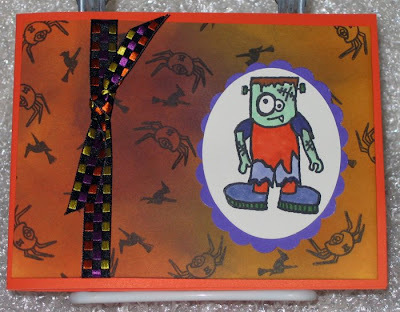 A little ribbon showcasing popular Halloween colours was the finishing touch! I absolutely adore this DP by Heidi Grace. It's from last year, but I liked it so much I saved some. This time, I stamped the Mummy and coloured him with Copics BV31 and a Cool Gray-3. I used my VersaMark pen and some clear embossing powder. Once I had heated it up and it was cool, I blended some inks over top, cut it on a funky angle, and attached it with black brads. I cut varying lengths of different ribbons and tied them around the middle with some gold thread usually reserved for Christmas cards, but it worked well for this application, too! The ribbon is attached with a puffy glue-dot for some dimension. Make sure you take a look at the eyes. I used two different coloured googly-eyes to make him scary, scary! Did it work? I've seen so many Christmas cards posted already so I thought I'd join right in! These are for swaps I'm participating in at The Stamp Shack. The first one is for a swap using moose stamps. Okay, I already had several so I joined that one. I call it Morris' First Christmas. The red paper is actually crushed velvet by Dooblebug. I stamped the image using Versafine Black ink and added Stickles for the lights entwined around his antlers. A little bit of colouring on the hooves and beard and it was done. The backside has The Shack template for ATCs which I was able to fill in by computer with all the details. I printed it onto DP also by Doodlebug. Next up is a swap named Black and White ATCs. I named it Silent Night. I actually had to do this one twice, but I learned a very valuable lesson. 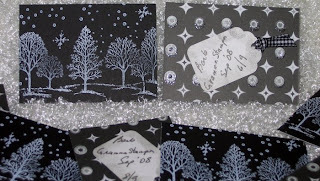 DO NOT STAMP WITH CRAFT INK ONTO GLOSSY CARDSTOCK UNLESS YOU INTEND TO EMBOSS THE IMAGE. IT JUST DOESN'T DRY! 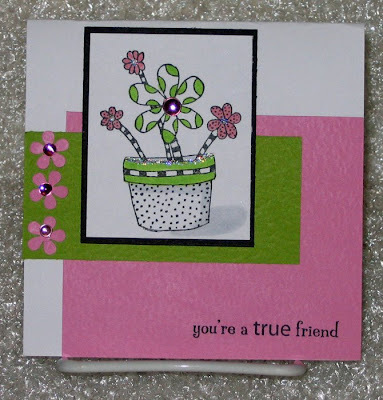 The image I used for this ATC is Lovely As A Tree by SU with some snowflakes by TAC. 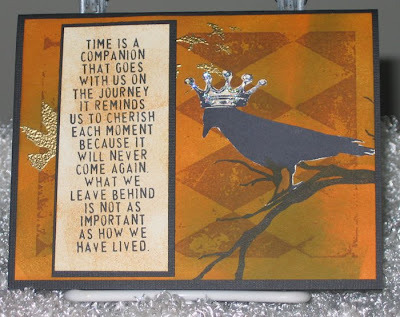 On the second go round, I used plain black cardstock, stamped with SU's White Craft ink. It dried fabulously! 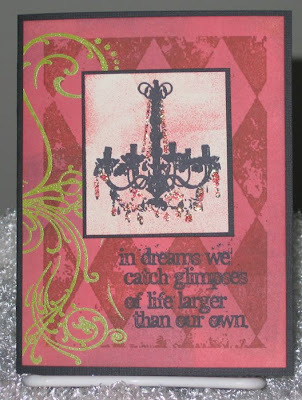 The flip side of the ATC is DP from DCWV Glitter Stack. Because I had no room for the details of the swap, I used some pre-made tags and added my name, date and number of the ATC, put on a little ribbon and adhered it with a glue-dot. Voila, it was done, too! The last of my current swaps is for a Gift Card Holder. It was actually very simple to make and I hope the other swappers like them. Merrybella is the star of this swap. I just love her for Christmas cards, she's absolutely perfect. 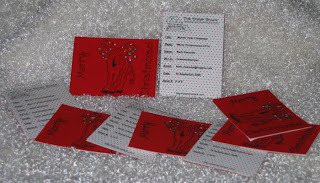 I used PTI Select White for the card holder, DP by American Crafts and some of the new SU in-colours, Riding Hood Red. It's great for that perfect Christmas red we're always looking for. Merrybella was stamped with Palette Hybrid Black ink and coloured with Copics. I added a little Stickles for the ornaments, used one of the older punches from SU, added some gold thread and popped it on the front. The sentiments on the inside are by PTI. The gift card gets placed in the centre portion and I used the slit punch on the top and bottom to hold the gift card in place. There you have it. Those are three of the five Christmas swaps I've joined. There may be more in my future, but I don't like to overload myself at any one time. Another lesson learned a while back. Next I'm on to Halloween. 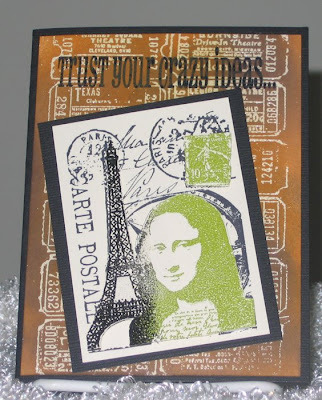 I just received my stamps from Jessica Lynn Original stamps and will be posting some cards within the next day or two. Please come back and check them out. Finally, I can attend classes if I want to! I say, "if I want to", because up in Thunder Bay, the opportunities were few and far between. Here in Guelph, there's a plethora of places to go for classes, being as Guelph is not far from either Toronto, Kitchener/Waterloo or London. I'm having a difficult time deciding where to go for classes. The Scrapping Turtle was my first place to attend a class. It's a wonderful store, with fabulous ladies who work there and a fine selection of product. I'm in Heaven! It was a class for dye ink backgrounds and I really enjoyed it. Here are the cards I made at the class. I'm not a huge fan of the collage-style, but I can see other uses for the inking technique. In fact, I'm working on one right now and I may have something to post later today. 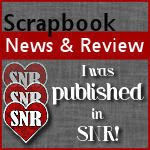 In addition to learning this new technique, I met a lovely lady, Debbie, and she is searching for a scrapbooking/cardmaking buddy. It seems that now her daughters are married, they have less time for the hobby. I'm so glad to have met her and I look forward to getting to know her and maybe go to some crops and stuff. That's it for now. I'm anxious to get back to my craft table to have some fun! See ya' later.